My husband finds this sandwich disgusting, but I think this is the ultimate comfort food. 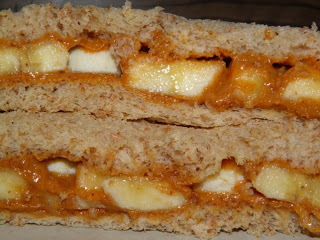 Nothing can beat the melted peanut butter and warm banana slices, yummmmmm. 1. Spread 1 tbsp of peanut butter onto one side of each slice of bread. Place banana slices onto the peanut buttered side of one slice and top with the other slice. 2. Place it into the panini maker and grill for 2-4 minutes.